Heralded by the new Total Recall and the recently announced Flatliners redux, the ‘80s have been all but strip-mined for source material, and short of a few remaining dregs—like an out-of-the-blue Beetlejuice sequel—and rather than resort to, say, a Moon Over Parador remake, it’s officially time to move on to scavenging the ’90s. Filmmaking is always evolving, after all, which is why they’re remaking Point Break, Kathryn Bigelow’s 1991 action sort-of-classic intersection of crime, surfing, quasi-philosophical maxims, and meaningful gazes between Keanu Reeves and Patrick Swayze. If we're going to grow as a culture, we must let go of the past, and embrace a slightly more recent past. 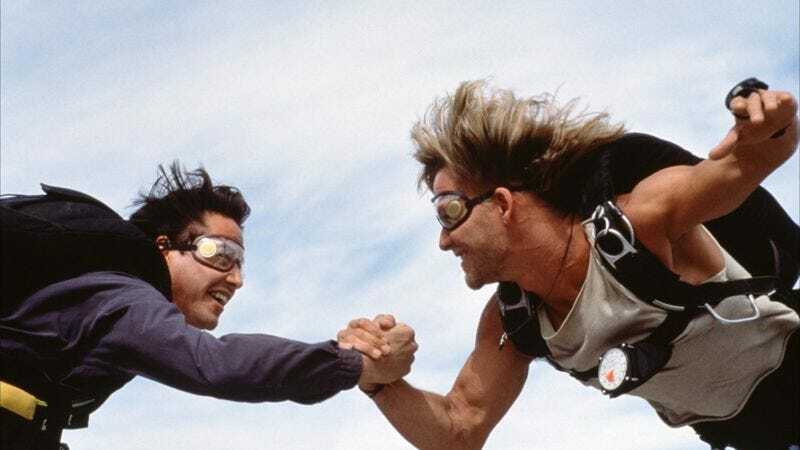 According to The Hollywood Reporter, a new Point Break script is already in the works from Kurt Wimmer, the writer and director behind slick, solidly average action fare such as Salt, Equilibrium, and Ultraviolet, and who helped lead the charge into this bold new decade to steal ideas from with his recent Total Recall script. Wimmer’s take is currently being fast-tracked by Alcon—the same “Hey, remember…?” production company behind the new Blade Runner—who plan to update Point Break by setting it in the less specific “world of international extreme sports” but still call it Point Break for some reason, despite the fact that “point break” is clearly a surfing term and does not apply to, for example, snowboarding or street luging or aggressive in-line skating. Of course, according to producer Michael DeLuca, the specific sport is irrelevant: “Point Break wasn't just a film. It was a Zen meditation on testosterone-fueled action and manhood in the late 20th century and we hope to create the same for the young 21st!” he said in a statement that actually contained an exclamation point, obviously hoping to spark some vicarious excitement. And indeed, the new Point Break also offers opportunity for Zen meditation—to realize that we are but reincarnations of our past, bound to relive the same experiences over and over again, this time maybe with some BMX.